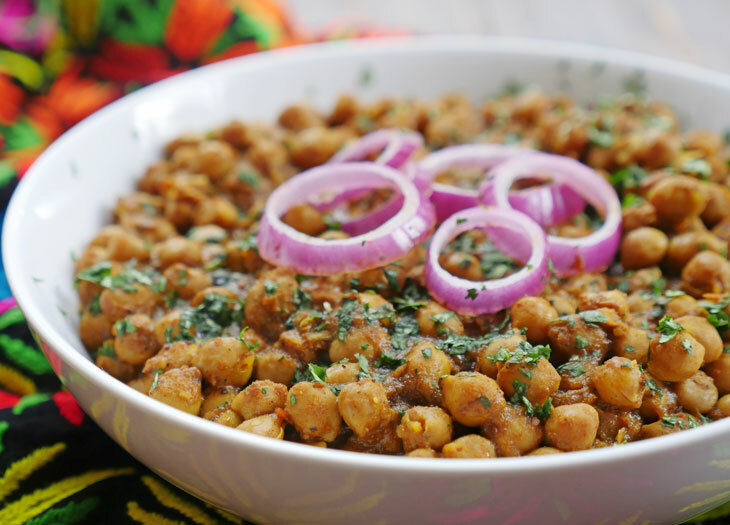 It usually takes several hours to prepare authentic Punjabi chole, but with this recipe, you can have delicious masala coated chickpeas on your plate in no time. The spices are key to making this curry, especially the dried mango powder (amchur) which adds tanginess and the roasted cumin powder which adds depth and aroma to the dish. Soak the chickpeas in cold water overnight. Drain, rinse and set aside. Press the sauté button. Add the oil and allow it to heat it up for a minute. Add the onion and bay leaf and stir-fry for 6-7 minutes, or until the onion begins to brown. Add the garlic, ginger, stir, then add the chopped tomatoes and cook for 5-7 minutes, or until they break down. Add the spices, stir, then add the chickpeas and water. Discard the black cardamom and the bay leaf, garnish with red onion and chopped cilantro. Forget to soak chickpeas? You can do a quick soak by covering dried chickpeas with an inch of water and pressure cooking them for 10 minutes with a natural release. Then dump out the water, rinse the chickpeas well and follow the chana masala directions from there. If you want a thicker curry you can mash it a bit. Roasted cumin powder is highly aromatic and has a more intense flavor than regular (unroasted) cumin. Do not substitute this with regular cumin as you won’t get the right favor. To make roasted cumin powder: heat a skillet over low heat and dry roast cumin seeds (I usually do 1 cup) for 5-10 minutes, stirring occasionally until the color of the cumin changes to a dark brown. Turn off the heat and allow the cumin seeds to cool down. Place the cumin into a spice grinder and blend until smooth. Store in an airtight jar and use within 6-8 months for the most flavor.